Speaking in New York, Mr Guterres said if any country doubted the need for the 2015 Paris climate accord, then other countries must "stay the course". 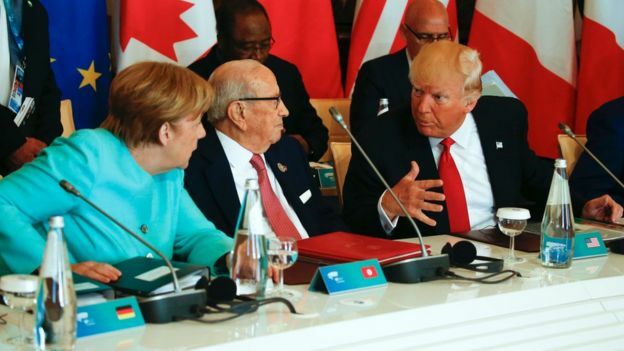 He was speaking after US President Donald Trump refused to join other leaders of the G7 group of rich nations in reaffirming support for the accord. He is due to decide the US stance soon. President Trump has previously dismissed global warming as a "hoax" created by China and has threatened to pull out of the Paris accord. Mr Guterres was making his first major statement on climate since taking office as UN chief five months ago. "If any government doubts the global will and need for this accord, that is reason for all others to unite even stronger and stay the course," he told the audience at New York University. "The message is simple: the sustainability train has left the station. Get on board or get left behind." He added: "The world is in a mess. It is absolutely essential that the world implements the Paris agreement." 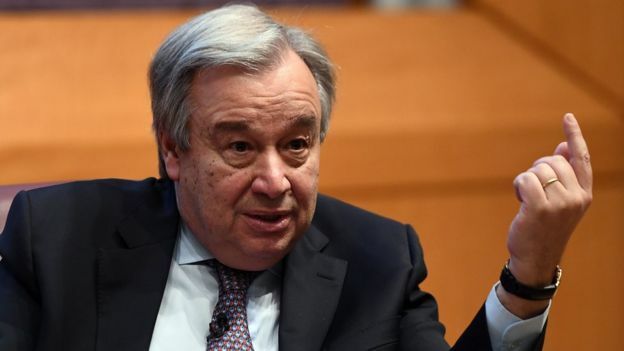 Image captionUN Secretary-General Antonio Guterres said climate change was "undeniable"
Responding to questions, he said: "We believe that it would be important for the US not to leave the Paris agreement. "But even if the government decides to leave the Paris agreement, it's very important for US society as a whole - the cities, the states, the companies, the businesses - to remain engaged." New York and California have already pledged to combat climate change without the Trump administration's support. The UN chief said he intended to convene a summit in 2019 to review progress on implementing the Paris accord. "Climate change is undeniable. Climate action is unstoppable," he said. The US is one of more than 140 countries and organisations that have ratified the agreement, but Mr Trump railed against it on the campaign trail saying it was bad for the US economy. He has repeatedly promised to strengthen the coal industry. The Paris deal is the world's first comprehensive climate agreement, with the aim of keeping the global average rise in temperatures below 2C. In order to do that, countries pledge to reduce their carbon emissions. Last weekend President Trump left the G7 summit in Sicily without reaffirming his commitment to the accord, unlike the other six world leaders in attendance.